The New York Giants needed to revamp the offensive line more than any other department coming into the 2018 NFL Draft. That was one of Dave Gettleman’s first missions as new General Manager this season — to display a better o-line. In the second round the Giants got one of their ‘Hog Mollies’ who can be plugged into the starting lineup immediately. That man is UTEP’s Will Hernandez. However, it wasn’t all rainbows and smiles leading up to the NFL draft for the 2-time AP All-American Hernandez and his family. His journey to the NFL was anything but traditional. It was a struggle to say the least. Hernandez’ family moved from Mexico to Las Vegas before Will was born. His father, Robert Hernandez, played professional soccer in Mexico and you can say that the athletic gene was already instilled in Will at a young age. Will grew up playing soccer, like his father, however, it wasn’t until 8th grade when he found the game of football. Then, during his Sophomore year at Chaparral High School, Will’s dream of playing in the NFL began to take shape. Just as his dream started to take form, Will’s family, his sister and parents, were hit with a devastating financial crisis, forcing them to move out of their home and into a tiny storage unit. This consisted of one bedroom, with two beds, one living room and a kitchen for 4 people. The ceilings in this storage unit weren’t very high, approximately 5’9”, and Will would have to contort his neck just to fit inside the de-facto apartment. There was an opening in the ceiling where Will was able to stick his head to stand up straight and stretch, when needed. The very thought of this struggle is overwhelming and brutal. I give him and his family all the credit in the world for dealing with this for two-years. But, like they all say, “What doesn’t kill you, makes you stronger,” and that couldn’t hit home more for the Hernandez family. Just when it couldn’t get any worse for Will and his family, Will’s grades fell and he decided to dropout of high school. He subsequently gave up football to go to work for his father’s construction company. However, Will’s family weren’t the only ones that believed in him. Two of his high school football coaches were determined and dedicated to bringing him back to school. Those two coaches explained to Will about the gift he had and how he could potentially earn a scholarship to play football if he was determined to fulfill his dream. Will did just that. Hernandez went back to school, chasing his NFL dream. Will was a dominant force on the field, but when it came to the classroom not even his large frame could pick him up. With perseverance and determination, Will eventually became a straight ‘A’ student, making him eligible to go to college and he attended UTEP. After those two long and difficult years, the Hernandez family moved back into their original home and out of the tiny shed. This was the biggest victory of all for the Hernandez family. The adversity and hardships the family dealt with made them all stronger, more positive and ultimately brought the family closer together. 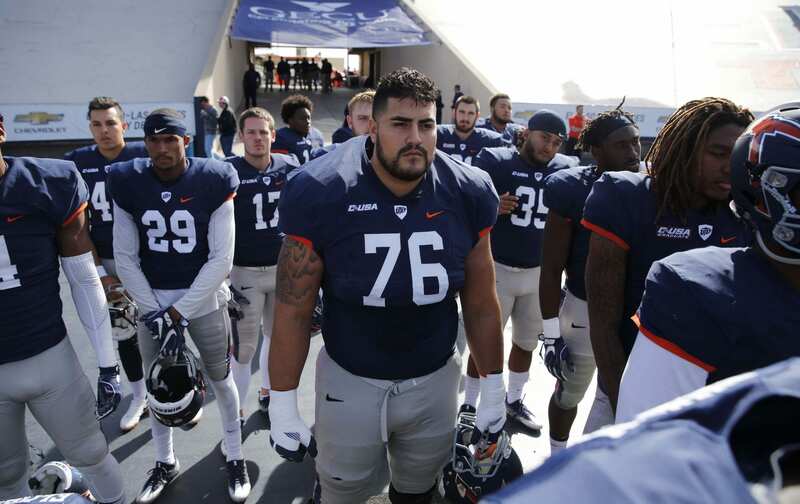 While at UTEP, after red-shirting his freshman year, Will went on to start all 49 games in his 4-year college career at left guard. As a freshman in 2014, Hernandez earned All-Conference in Conference USA. In 2016, he was first team All-Conference in Conference USA as well as second team AP All-American. Hernandez then dazzled NFL scouts at the combine and was projected to be a first or second round pick. Scouts had him graded as a first-round draft choice and the No. 2 ranked guard in the draft. It was a surprise to all that he managed to fall all the way to the Giants at No. 34 int he second-round. At that moment, Herenandez’ life changed forever. Will, surrounded by his family and friends, watched on at their home in Las Vegas as Justin Tuck read his name. The combined efforts of Will and his family had finally paid off. From watching his reaction to hearing his named called, it was more of a sign of relief from all the hard work and struggles that he and his family endured. Hernandez himself stated, “I’m going to give 100% to whichever team selects me.” That is exactly what the Giants are going to get with this man. Will should be immediately plugged into the starting offensive line. However, nothing is set in stone, but his ability, toughness, blocking and strength can guarantee that he will have a long, successful NFL career. Now that he is a New York Giant, there is plenty of more work to do. Hernandez will be looked upon to help rebuild the offensive line, built of ‘Hog Mollies’. Big shoes to fill as a rookie, however, from all the adversity and experiences Hernandez has already faced, he will be ready for anything that is placed in front of him. The journey for Will and his family is not over, it’s only beginning.